Is it smart to include marketing at the highest levels of strategic planning? At Vya, we think so. Organizations across a wide range of industries are searching for ways to gain their competitive advantage in the face of rapidly changing market dynamics. More than ever, marketing’s influence and insight can and should play a role in high-level business strategy. Recently we organized our latest analysis on this topic into an infographic that features some compelling third-party data. 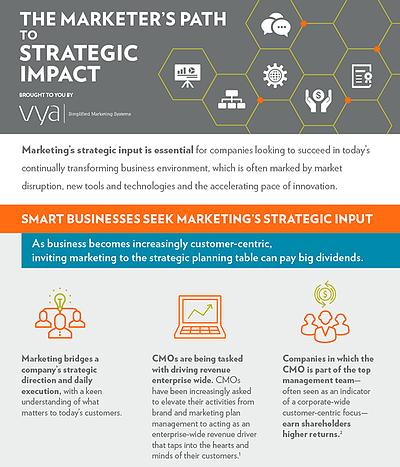 If you want to know what CMOs are thinking about their strategic impact and how they can overcome obstacles to their strategic influence, check out our infographic, “The Marketer’s Path to Strategic Impact” on MarketingProfs. 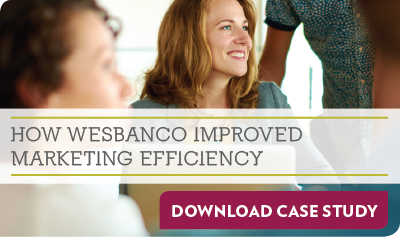 The insights highlighted in our infographic are tremendously relevant for bank marketers. Our own Kandi O’Connor previously wrote about how rapid transformation in the banking and financial services industry is making it vital for bank marketers to be involved in the strategic process. She explained how “Marketing bridges a bank’s strategic direction and daily execution, with a keen understanding of what matters to today’s banking customers.” Read Kandi’s blog post here.